BUENOS AIRES: Leaders from the world’s leading economies gathered for the G20 summit in the Argentinian capital on Friday to discuss development, infrastructure and investment. Saudi Arabia’s delegation was headed by Crown Prince Mohammed bin Salman, who was greeted by world leaders including Vladimir Putin and Emmanuel Macron. The summit is overshadowed by issues including the US-China trade dispute to the conflict over Ukraine. Also expected to loom are tensions between the United States and Europe. Saudi Crown Prince Mohammed bin Salman met with South Africa’s President Cyril Ramaphosa on the sidelines of the G20. They discussed cooperation in the fields of energy and investment. Saudi Crown Prince Mohammed bin Salman attended a Gala event at Colon Theatre with other leaders of the G20. 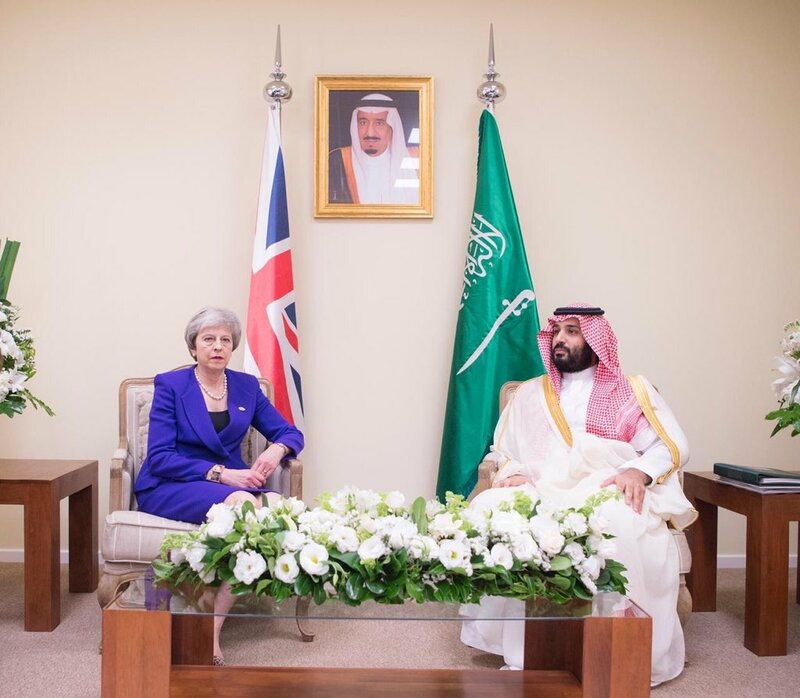 Saudi Arabia's crown prince meets with the UK's Prime Minister Theresa May in the sidelines of the summit on Friday evening. Thousands of demonstrators are flooding a downtown avenue in Buenos Aires to protest against the G20 summit, AP reported. Activists from France, Germany, Italy and several Latin American nations are taking part alongside Argentines in a demonstration organized by left-leaning groups and labor unions. About 22,000 police officers and other security forces are guarding the world leaders. Saudi Arabia's energy minister Khalid Al-Falih has met with the Russian energy minister, Alexander Novak to discuss oil output. SEE MORE: For the best images of the world's most powerful shaking hands and talking shop, click here. Crown Prince Mohammed bin Salman continued his series of meeting with world leaders. He met with Chinese President Xi Jinping and the country's two delegations held talks. Donald Trump lauded "good signs" ahead of talks with his Chinese counterpart Xi Jinping on resolving their trade war. "There's some good signs, we'll see what happens," Trump said. He is due to have dinner with Xi on Saturday. Crown Prince Mohammed bin Salman held a meeting with the Indonesian Vice President Jusuf Kalla. Earlier he met with the South African President Cyril Ramaphosa. #LIVE: At the #G20Summit in #BuenosAires Crown Prince Mohammed bin Salman meets with the vice president of #Indonesia Jusuf kalla and #SouthAfrica President @CyrilRamaphosa. Saudi Arabia's energy minister Khalid Al-Falih will meet with his Russian counterpart Alexander Novak during the summit to discuss an oil output in 2019, the Russian news agency RIA reported. Novak also said that Russia's 2019 oil output is expected to be at the same level as this year but could be adjusted, depending on a deal between OPEC and non-OPEC members. Producer group OPEC and its allies are meeting in Vienna next week to discuss oil production. G20 leaders including the presidents of the United States, Russia and China opened summit talks on Friday. Argentinian President Mauricio Macri convened the two-day summit in Buenos Aires with a call for member nations to support international cooperation and multilateralism. He added that it will be an agenda "centered on people." Crown Prince Mohammed bin Salman and Russian President Vladimir Putin both grinned broadly and shook hands robustly as leaders converged for the start of the 2-day summit. 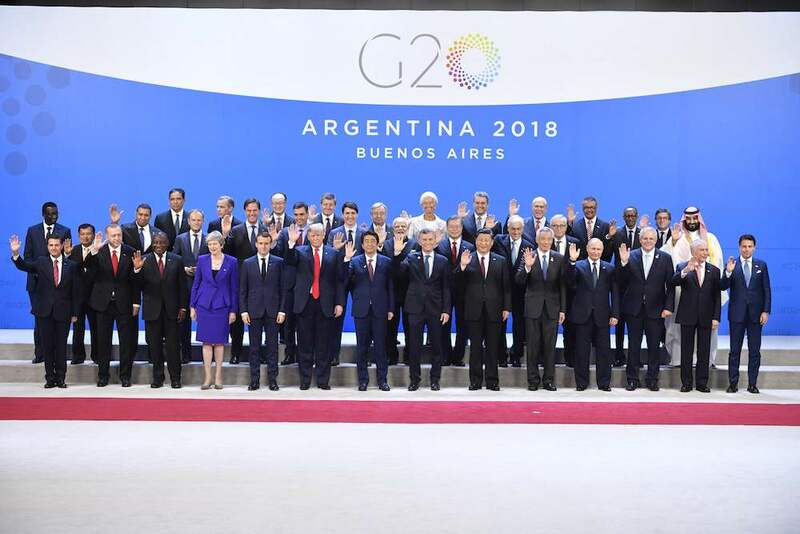 Participants of the G20 Leaders' Summit in Buenos Aires, pose for a family photo. Saudi Crown Prince Mohammed bin Salman held talks with a number world leaders on the sidelines of the G20 summit. The crown prince spoke with French President Emmanuel Macron and others at the summit venue on Friday in Buenos Aires. READ MORE: For an alternative guide to the meeting in Buenos Aires, click on Frank Kane’s G20 diary. Today he discusses the obligatory taxi driver story, the state of Argentina’s economy and some of the fine venues where world leaders will conduct their business. Saudi Arabia's Crown Prince Mohammed bin Salman arrived at the G20 summit in the Argentinan capital, Buenos Aires. Russian President Vladimir Putin on Friday denounced the “vicious” use of sanctions and trade protectionism, in a veiled swipe at Donald Trump at the G20 summit. “One cannot help but see a dishonest competition increasingly taking the place of honest dialogue based on equality among states,” Putin told leaders of emerging economies as the summit opened in Buenos Aires. “A vicious practice of returning to illegal, unilateral sanctions and protectionist measures is spreading, going around the UN Charter, the rules of the WTO and internationally recognized legal norms,” Putin said. Putin said that the result was “an extremely negative effect on the spirit of international cooperation,” discouraging business. British Prime Minister Theresa May will hold a bilateral meeting with Saudi Arabia’s Crown Prince Mohammed bin Salman at the G20 summit in Argentina, her spokesman confirmed on Friday. The leaders of the United States, Mexico and Canada on Friday signed a huge regional trade deal to replace the old NAFTA, denounced by President Donald Trump as a killer of US jobs. “This is a model agreement that changes the trade landscape forever,” Trump said at the signing ceremony in Buenos Aires, on the sidelines of the G20 leaders’ summit. Saudi Crown Prince Mohammed bin Salman and Indian Prime Minister Narendra Modi met in Argentina and discussed cooperation between the two countries in security, energy and investments, the Saudi Press Agency (SPA) said on Friday.